Birgit Schulze (left) and Shell Spillenaar with three of their Bernese mountain dogs in their home on the Domaine Summum property. Small plate menus, beer concierges, rooftop bars. Countless amenities attract travellers to the unique offerings of hotels. 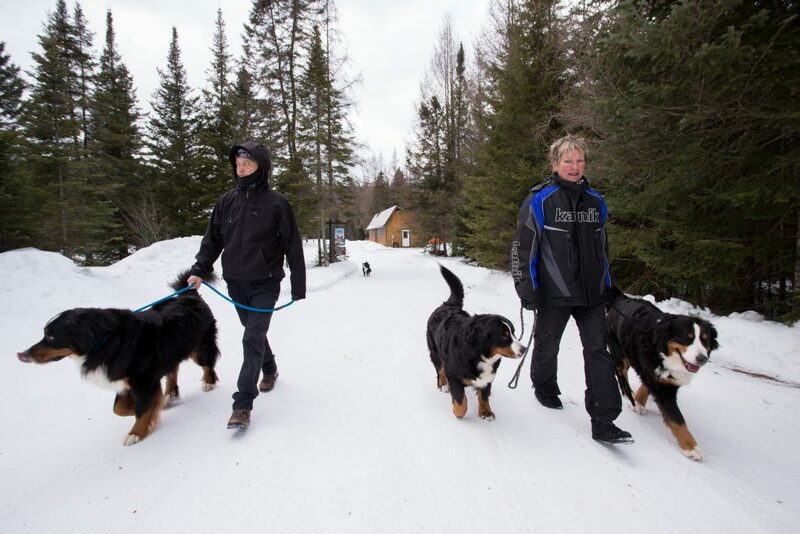 But Domaine Summum, an 81-hectare wooded property at the end of a road near Mont-Tremblant, Que., has something better: six furry, tail-wagging, 45-kilogram staff members, also known as the Bernese mountain dog pack. There’s Destiny, Tango, Shirley Pearly (the oldest of the females), SoHo, Shiraz (the youngest) and Baltazar, the only male. And on this wintry weekend, Bruno, my 10-month-old springer spaniel, along with several other canine guests, will be added to the mix. Domaine Summum takes the concept of a dog-friendly hotel to a new level. There’s the Woof B&B Spaws, for instance, as well as a cocktail session called Yappy Hour (in the summer by the gazebo, in the winter around a bonfire), homemade pizza and playtime with the berners at the host’s house and an à la Bark Menu, featuring extravagant canine treats such as cheeseburgers and sweet potato chews. The general idea, as you may have guessed? Dogs unleashed. Bruno, the writer’s springer spaniel, dashes down a trail at Domaine Summum. “This is the life,” I say on a Saturday morning, as I set out a breakfast of granola, blueberries and Corn Pops for my two daughters, Bianca, 7, and Josephina, 12. Outside, we can see quiet, snowy vistas. The espresso pot stirs on the stove. We’ve only been here one night, arriving after a two-hour drive from Ottawa on winding dark roads, but have quickly settled into the time-expansive feeling of cottage life. Our home for the weekend, the King Auberon suite, is warm and uncluttered, with pine walls and comfy cottage furnishings. What it lacks is equally important: the flotsam of family life (erasers! socks! homework!) that tempts our chew-happy puppy and keeps us constantly on guard. “This is the ultimate dog life,” corrects Bianca, as she stands on the dog bed, a four-poster affair set up under the living room window. “I’m sleeping there tonight if you don’t,” she warns Bruno, who lolls under the table, happy to be relaxing around us. We can’t laze around in our pajamas too long this morning, however, as one of us has a spa appointment. Bruno gets the full treatment — a brush, a bath and a nail trim — from groomer Gail Rodden (left) at Domaine Summum’s Woof B&B Spaws. 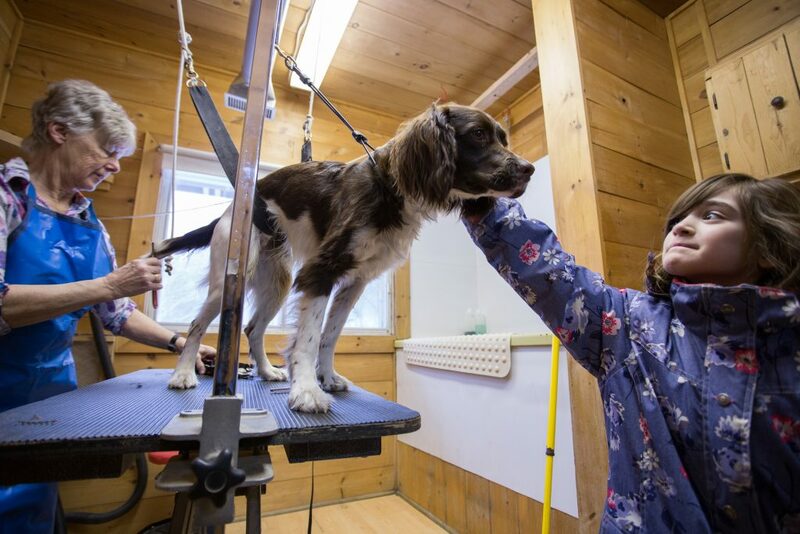 “Come on Bruno, time to get pretty,” says Gail Rodden, Domaine Summum’s groomer. We’ve left the cottage and taken a short walk to the Woof B&B Spaws, a long building partially heated by a wood stove that also houses a kennel. While Bruno gets set for a brush, bath and nail trim (admittedly not as fun as a Swedish massage, but, boy, will he smell better), we head to an open-gated space on the other side of the building to meet some of the four-legged staff members. We find Destiny walking on a treadmill, the white tip of her tail wagging, her tongue out in that happy Bernese smile. Erratic winter weather has brought snow, rain and then cold, and the woods are now blanketed in a frozen crust of ice that could damage the heavy dogs’ ankles if they were to romp outside. So instead, the resident Bernese are taking turns on the treadmill, guided gently by staffer Rod Zalameda, who stands in front, encouraging Destiny’s three-kilometre-an-hour pace. Shiraz and Tango relax on queen-size dog beds, a blue dragon stuffy on the floor, giant letters spelling out “Woof” on one of the walls. When it’s Shiraz’s turn, she rolls onto her back, paws in the air. “She’s trying to avoid her turn on the treadmill with a belly rub,” laughs Zalameda, his dark hair up in a bun. “Oui, par ici. Here we go,” he says, as Shiraz relents and steps on the treadmill. 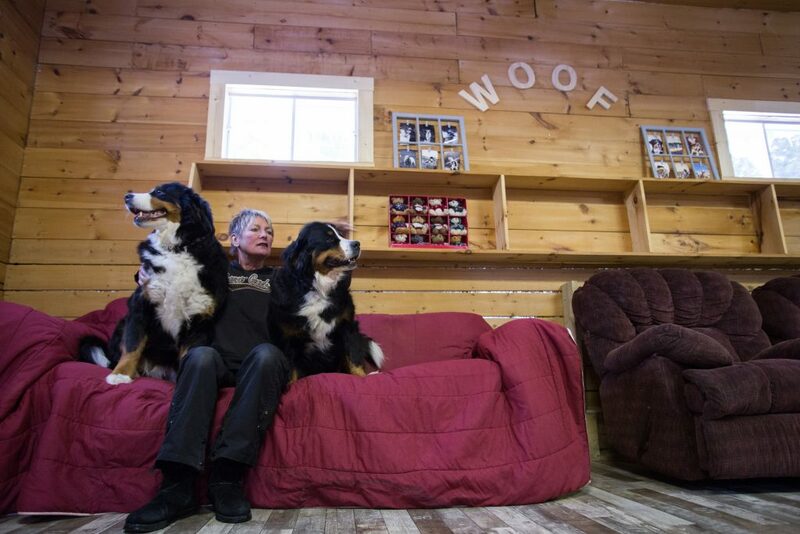 Birgit Schulze, the owner of Domaine Summum, gets some down time with two of her six Bernese mountain dogs at the Woof B&B Spaws. Like many dreams, it required plenty of labour: clearing the land, milling the wood on-site, building a home and bringing in the road and power. And also like many dreams, it changed, at times unbidden, morphing from horses into a business of Bernese puppies and cottage rentals. Construction spread to include four suites and the Main House, the five-bedroom Grande Cabin and the kennel. It’s late afternoon and we’re in the Main House for pizza and time with the dogs. Plants hang in the windows, a circular fireplace takes centre stage and odes to dogs abound, including a Bernese portrait and a sign in the kitchen that says “Bone appetit.” Schulze’s partner, Shell Spillenaar, is serving up spicy chicken wings (inspired by their recent trip to Mexico) and pizzas with tomatoes, fresh basil and blue cheese from an electric pizza grill. Josephina and I are perched on stools at the island, but Bianca is on the floor with the Bernese. Bruno, being not yet neutered and a puppy, is hanging out at the Woof B&B Spaws. Living with a pack, Schulze is always measured about how the dogs meet and mingle. If she’s anything, Schulze, with short blonde spiky hair and a welcoming demeanor, is energetic. In one weekend, she trims dogs’ nails, confers with Zalameda over the schedule for the boarding dogs, pays a contractor who’s come to fix water lines, gives a puppy talk to prospective owners (there are 10 names on the waiting list for Bernese puppies and Schulze thinks Shiraz may be pregnant), hosts a guest bonfire accompanied by mulled wine and coordinates the rescue of their 18-year-old cat, who has somehow trapped herself in the attic of the Grande Cabin. 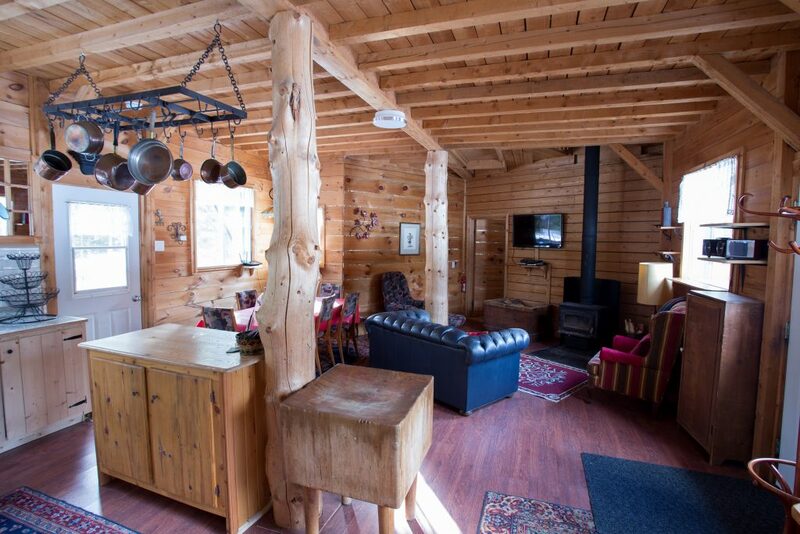 The common room of Domaine Summum’s Grande Cabin, a fully equipped five-bedroom cottage. 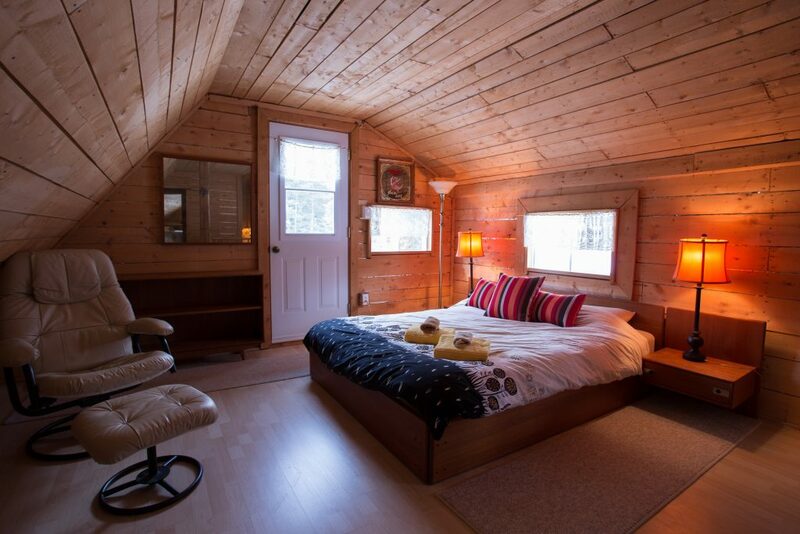 One of the five bedrooms in the Grande Cabin. Besides being the cook for the dogs, Spillenaar, with her dark hair and punky vibe, is also the queen of the canine pun. When I text to send my thanks following the visit, she texts back: “Have a woof-alicious day!” She just can’t help herself. Schulze and Rod Zalameda take Schulze’s Bernese mountain dogs for a walk on one of the trails at Domaine Summum. The Domaine mission — dogs unleashed — feels both literal and figurative. 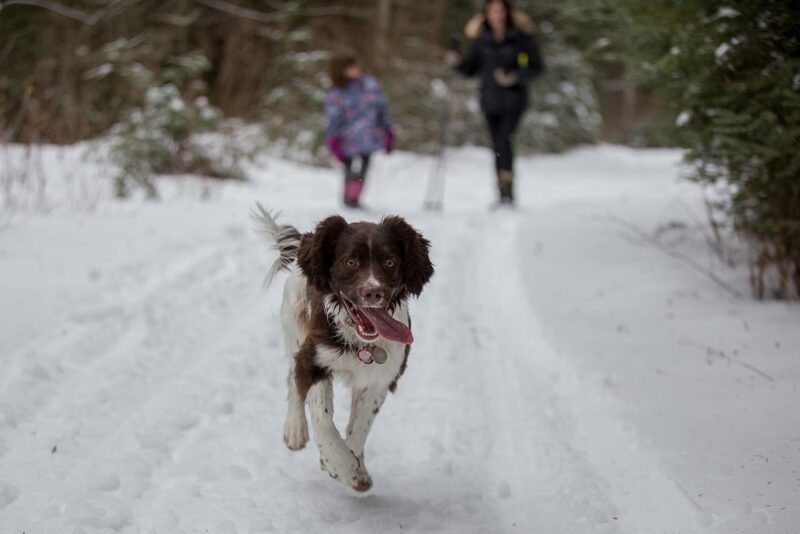 Dogs can run free on the property’s five trails, but that feeling also extends to one’s stay. When guests (on their ninth visit) arrive with their two dogs in the suite across from us and some barking ensues, I move to quiet Bruno but I don’t feel that sense of panic that we’re disturbing everyone. And just being outside, away from work and homework and household chores, feels restorative for all. On Sunday morning, I leave the girls at the cottage watching cartoons and follow the snowmobile trail across the road to take Bruno for a final walk before our drive home. (True to her word, Bianca has spent some time curled up on the dog bed, reading.) The snow is still crunchy, but proves no problem for Bruno’s light frame. The sun is out and the details of the forest emerge: the tiny pinecones that have fallen overnight, the crystal sparkle of the snow, the birdsong that gathers in a clump of trees and then suddenly scatters. Bruno bounds ahead and sparks in me that feeling of fulfilment that comes from being outdoors with a happy dog. When you talk about dogs, you can talk about the canine relationship that goes back 15,000 or more years as we inch by inch turned wolves into companions. You can talk about how dogs lower our stress and how their contented sighs are worth their weight in gold. You can talk about how dogs stitch together family bonds, get us outside in all types of weather and teach kids responsibility (apparently). You can also talk about dog farts — especially in the contained space of a road trip — that bond us together in shared outrage and frantic window lowering. This is clearly evident as I flip through the guest book in our suite. Page after page features thank-you notes that in the sign-offs include the Wallys, the Princes, the Mooglies and the Brunos. It’s true that dogs are a labour of love with all the requisite exercise, training and vacuuming. Bruno certainly eats into my already limited hours of the day. He also steals the odd sock and omelette off the dining room table. But dogs also steal our hearts. And who doesn’t want to holiday with the ones they love? 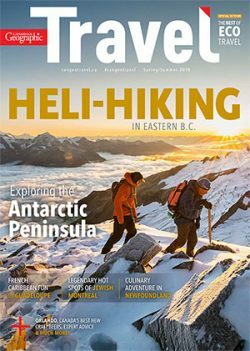 Karan Smith (@karan_smith) is a travel and feature writer whose work has appeared in WestJet Magazine, the Globe and Mail, CAA Magazine and Canadian Geographic. Ben Powless (@BenPowless) is a contributing photographer at Canadian Geographic.